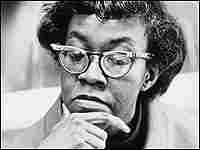 Gwendolyn Brooks Captures Chicago 'Cool' Gwendolyn Brooks' best-known work tells the chilling life stories of seven young men in eight short lines. She took her inspiration for "Seven at the Golden Shovel/The Pool Players" from a pool hall in her native Chicago. Read "The Rites for Cousin Vit"